Following a route less traveled in the footsteps of intrepid explorers and today's First Nations in one of the last frontiers: the Arctic. Knowing that I was setting out on the same route that Franklin took in 1845 somewhat intimidated me. After all, he didn’t make it home. However, once aboard Adventure Canada’s Ocean Endeavor expedition ship surrounded by 110 like-minded adventurers, 30 experts in every field and a crew that went above and beyond, intimidation quickly transformed into exhilaration. Needless to say, Franklin did not have access to advanced navigational equipment, cool linens, hot showers, three delicious meals and a variety of entertaining and educational distractions to battle the cold, the boredom, the frustration, the mutiny and his inevitable doom. But I did. 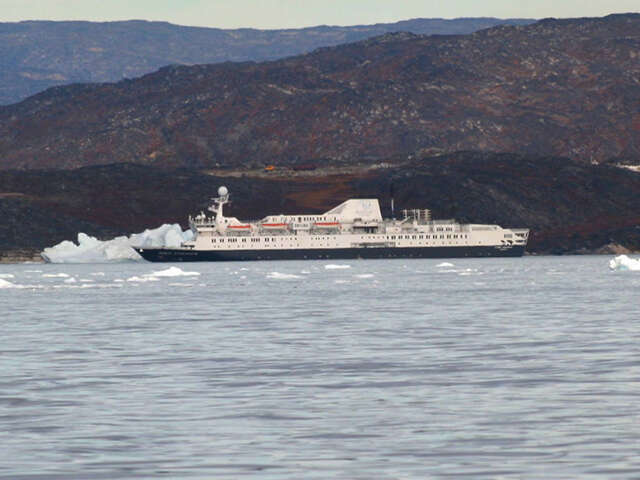 Ocean Endeavour anchored outside Ilulissat. Franklin started in England. Our adventure started in Kangerlussuaq, Greenland, where, en route to our ship, I saw my first musk ox! Although cold and somewhat damp throughout our walk on our first stop, Sisimuit, the sight of Arctic huskies – chained to rocks – and this town of 6,000 quickly reminded me how far I was away from my reality. Striped and polka-dotted dog sleds leaned against porches and dilapidated shacks waiting for passengers. 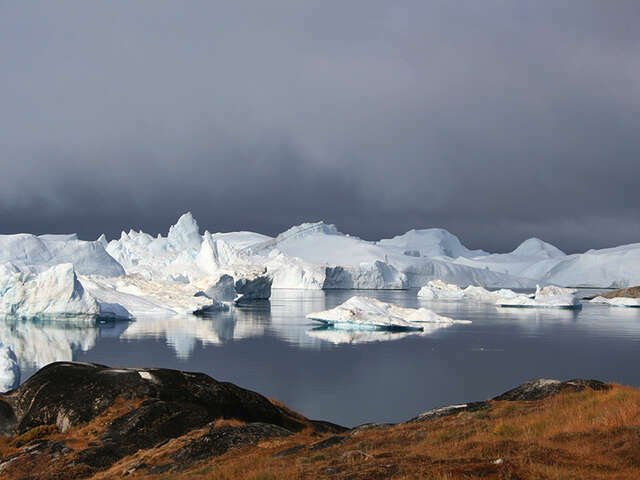 Ilulissat offered a completely different perspective. Its wooden boardwalk – built to protect the wetlands – provided spectacular views at every turn – and led us to the Icefjord, now a UNESCO World Heritage site and the fastest moving glacier in the world. 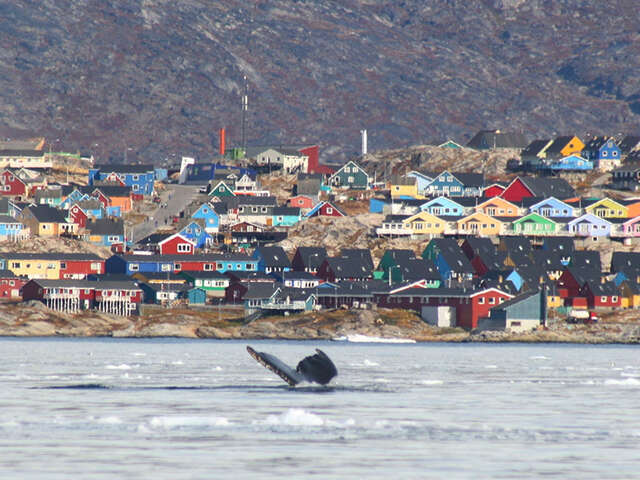 On an afternoon jaunt, I just happened to turn my head at the right time to cathch this humpback whale entertaining the town of Ilulissat. Although the trip so far was awe-inspiring, it was Karrat Fjord that welcomed me into its embrace. I felt at peace here and could have happily lingered all day looking out to sea for humpbacked whales or inland to the garden of icebergs that reminded me of a gallery Lauren Harris paintings. Karrat Fjord reminded me of visiting a live Lauren Harris gallery. Sightings of Arctic hares at both Kap York and Etah pleased John Houston, a member of the expedition crew, but my takeaway that day was the memory of our singer/songwriter/zodiac driver Kevin Closs singing a sea chanty to distract us from the bitterly cold wind and waves. 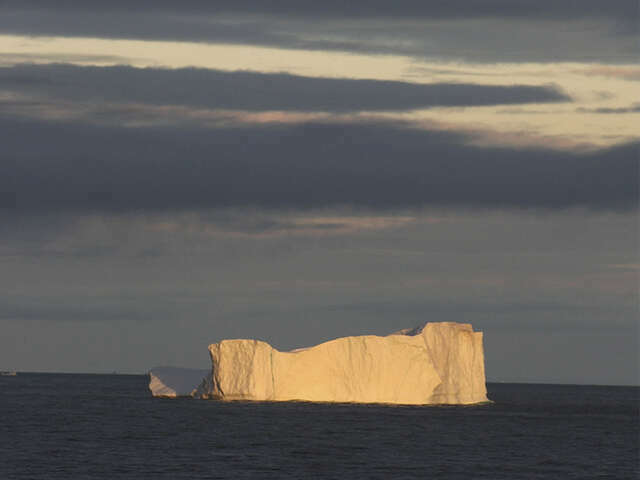 It’s been quite a while since we had seen the sun but it certainly boasted it glow on this iceberg somewhere near Etah. 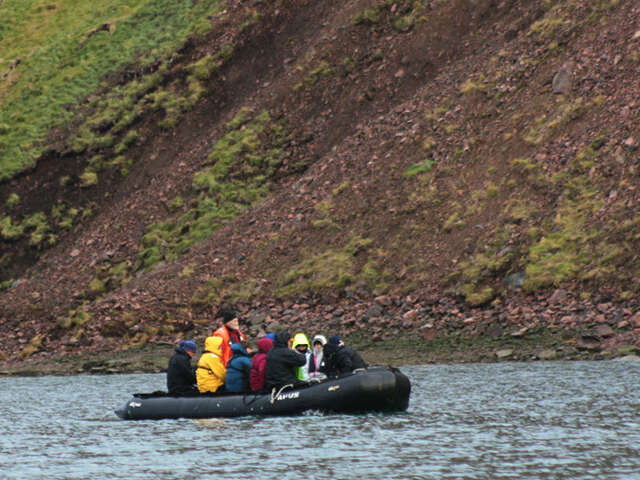 Here we are in Foulks Fjord, lead by John Houston, determined to spot an Arctic hare. 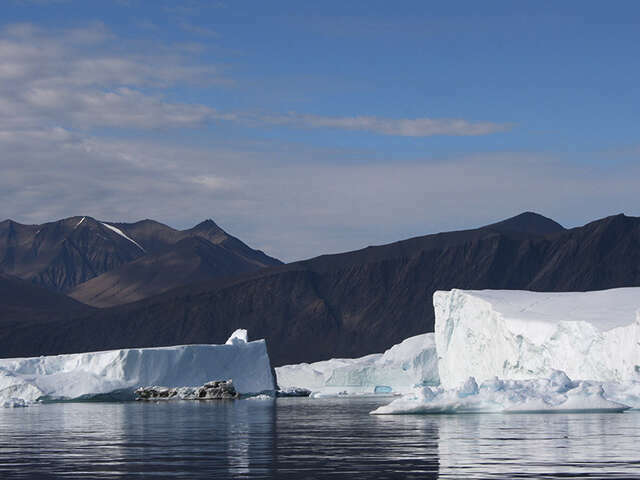 We depart Greenland with its Craylola-coloured houses and majestic icebergs to cross Baffin Bay and head back to Canada. It’s Day 8. We are halfway through the Northwest Passage; there are still lessons to learn and stories to tell. Bad weather prevented a visit to Aujuittuq – Canada’s northernmost civilian community – so we ventured on with a revised itinerary thanks to Denise Landeau, our tireless expedition leader. And so it goes in the Arctic. Expect the best, prepare for the worst. It is an expedition after all. Over the next few days, I learned more about Canada’s north than any high school history class could offer. 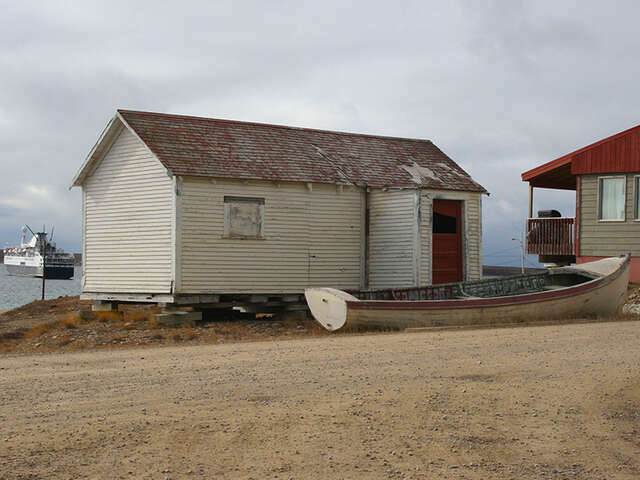 Dundas Harbour, on the south coast of Devon Island, housed one of four abandoned RCMP detachments. For three years, RCMP officers lived with no radio contact and a yearly delivery of provisions. Today, the dilapitated building remains standing along with three graves. Beechey Island was living proof of Franklin’s demise. The four graves there brought an uncommon silence among us that was thankfully broken by the voice of Ken McGoogan regaling his story of the Northwest Passage. I can’t begin to describe the emotional wave that comes over you as you stand quietly at the foot of these three graves of Franklin’s crew (Petty Officer John Torrington, Royal Marine Private William Braine, and Able Seaman John Hartnell) on Beechey Island. After a rather sombre walk through snowflakes and a bitter breeze, we reloaded ourselves into the Zodiacs, ready to go home. Ree Brennin-Houston had other ideas. Heading away from the ship (where warmth, a cup of hot tea and biscuits were waiting), many of us found ourselves surrounded by a flote of beluga whales, disguised so well as to be confused with the low-lying icebergs around them. At one point, we counted 13. 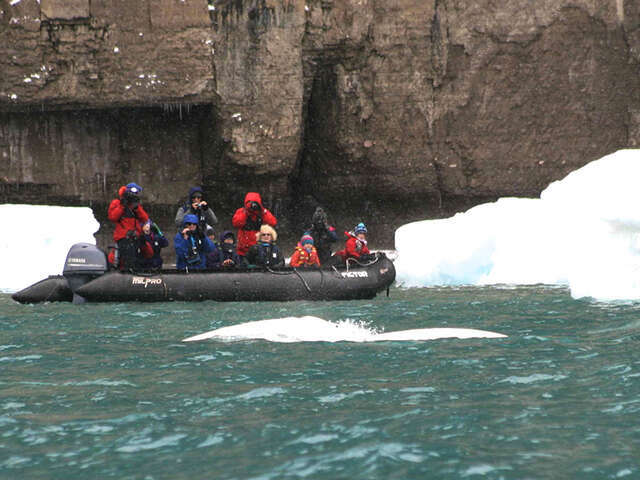 It was hard to tell the difference between the icebergs and the belugas. Fort Ross was home to the last Hudson’s Bay Trading Post built in the Arctic. After 11 years, it was closed due to ice restricting travel and trade. The main building still stands and is sometimes used as base camp for research scientists and some very brave sailors. It felt important to cross off my Arctic’s Big Five (polar bear, humpback whale, Arctic hare, muskox and beluga) and compare it to my Africa’s Big Five (which I accomplished in 2009). There were high expectations of seeing a polar bear, but they were few and far between, however in the end, we did spot 12, mostly from afar. Check! This trip also offered sightings of several other mammals including minke whales, harbor seals and a single lemming. Bird-lovers on board spotted nearly 40 species from Arctic terns to Thayer’s gulls. Check, check! Fort Ross was home to the last Hudson’s Bay Trading Post built in the Arctic. A Gem from our Past. Hope for the Future. Every day, geologists, zoologists, naturalists, historians, photographers, documentarians, authors, biologists, and scientists would teach us with immeasurable passion about the region we were so very blessed to explore. 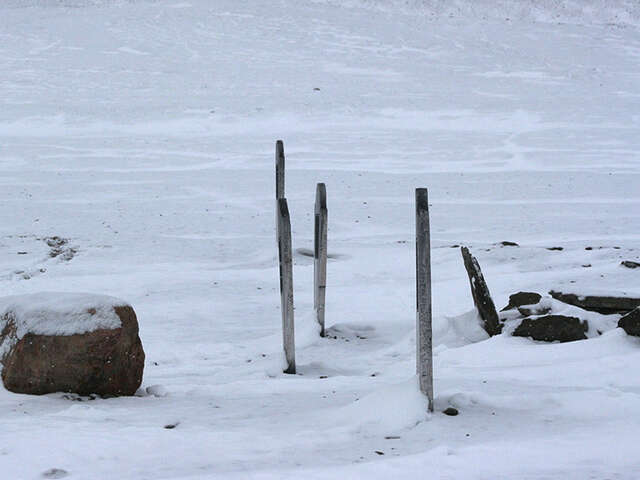 A leader and political activist, a culturalist, an educator, a musician, and two archaeological mentees, all from Nunavit were also present to share their stories and teach us more about the way of life as it is today at 70 degrees north of the equator. Their stories came to life during day visits to Uqsuqtuuq (Gjøa Haven) and Cambridge Bay. 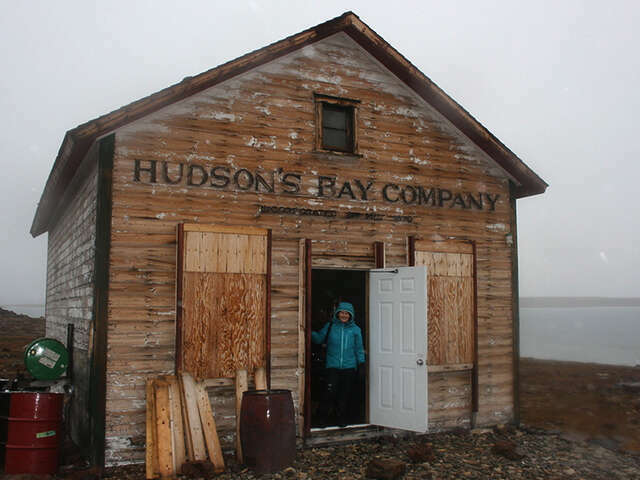 Our visits to Gjoa Haven and Cambridge Bay were history lessons in themselves. It is truly hard to imagine how people can live, let alone thrive, in these desolate places so far from the many services we take for granted on a daily basis. 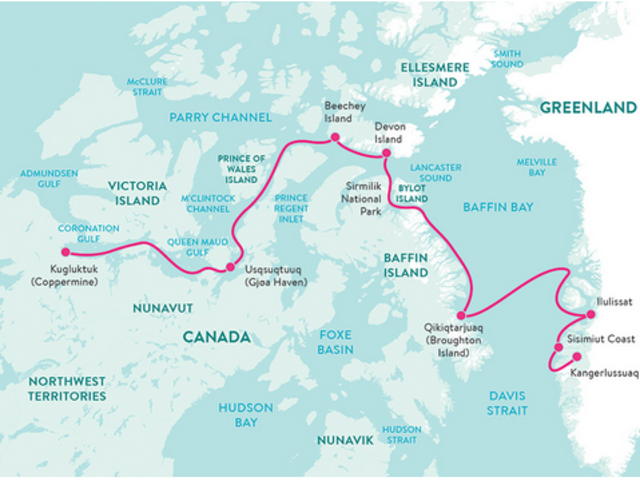 Our 17-day itinerary with Adventure Canada was designed to maximize our Arctic experience, jam-packed with knowledge-sharing, story-telling and entertainment. This journey is not for the faint of heart, however for anyone who cares to dare, it will expand your horizons, warm your heart and leave a lasting impact on Nunavit and on you.